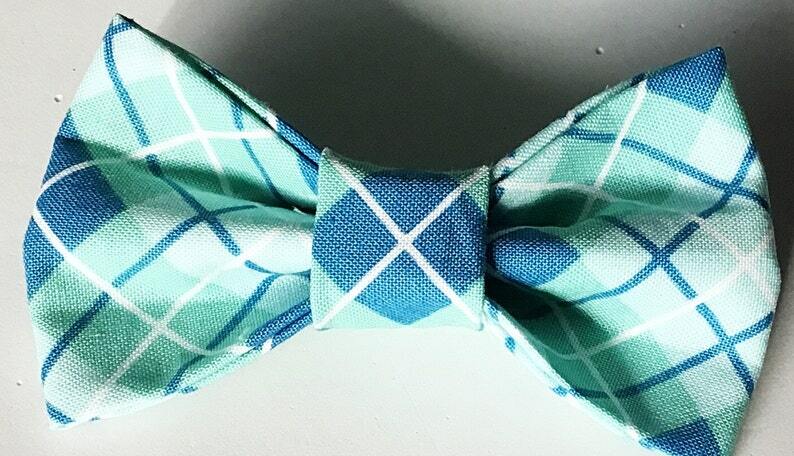 Fasten this Blue & Green Argyle Male Dog and Cat Bow Tie to your pets collar for daily casual wear or for special events. The blue, white and green argyle fabric is a perfect blend for all doggy and kitty cat's fur. The bow tie attaches to the collar by the way of wraparound velcro which I have added to the back of the bow tie. It can be trimmed down to collar size as needed. Love the pattern and the quality :) Our dog looks so handsome with it on!